David Sibray visits the Ebenezer Church (est. 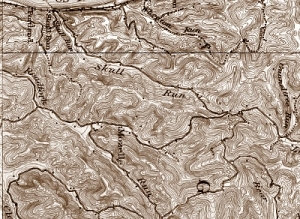 1880) beyond the Low Gap at the head of Skull Run. 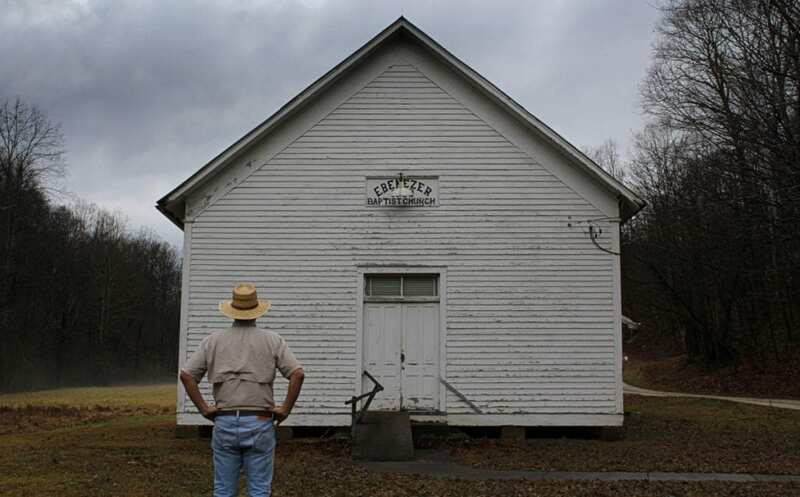 A traveler wandering the pastures along Skull Run might have little idea of the dark tales that have arisen in that section of Jackson County had he or she not opened one particular book of history. Apart from the ominous name, “Skull Run,” the vale with its grazing cattle seems a world away from warfare, but according to the late historian Nathan Goff Carder, red clay isn’t the only substance that turns the stream red after a rainstorm. According to Carder, in 1790 an otherwise undocumented battle erupted at the head of the run where a small group of natives led by Irish pioneer Zeri Kidlow fought off an attack of Shawnee. Kidlow, an emigrant who had escaped debtor’s prison, had been floating down the Ohio River one evening in 1781 when he spotted an embayment at the mouth of the run and decided to investigate. 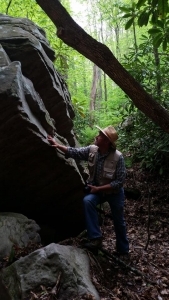 FREE Newsletter: Join David Sibray, and explore W.Va.
Kidlow and his companions chose to confront the Shawnee at the head of the hollow at the “Low Gap” the led into the valley of Little Pond Creek. There the opposing sides battled with fists and tomahawks until Kidlow, hidden high in an oak, let loose a barrage of profanities that Carder claims spooked the Shawnee. “Once concealed at this lofty eminence, he released a withering blast of scorching, devastating profanity to east, to the west, and all directions between,” Carder wrote. “It’s strange how readily the English language lends itself to profane eloquence when the cause is a just one.”Though the battle was won, Kidlow, upon returning home, found his wife wounded and his son decapitated and “swore by his beard and by the shades of all Irish deities” to avenge the death. Though his native companions forgot the battle, Kidlow developed a bloodlust, and would return from manhunts with the heads of Shawnee victims. The Shawnee, however, were impressed, and named him “Chief Skull” — “Catawaypetheaway Okemah,” according to Carden. Whether Carden’s tale is true is a subject of much speculation, and he cites no sources for his work. However, his tales are considered valuable to local enthusiasts. His tale of Skull Run, along with other local histories, was collected by Appalachian Wordsmith and published by Star Printing Co., of Ravenswood, West Virginia, with a grant made possible by the Bernice Pickens Parsons Foundation. The publication and all proceeds are property of the Jackson County Public Library.